It would appear that you’ve wasted the $100 if you can’t get a refund (I doubt that you can), but in spite of that, it’ll be easier to use the free cert than using the one you paid for. I am seeing mix content now that I enabled Let’s Encrypt. Where do I find what to change to make everything https://? Visit Admin -> Settings and search for ‘https’ - make sure ‘Force HTTPS’ is turned on so that all local URLs are rewritten to reference the secure path. If you have any customisations which explicitly reference off-server HTTP resources they may need to be manually corrected. I am having trouble with my SSL. My subdomain, which is a different host (DO, droplet), should be covered by the main SSL. The subdomain is throwing a 521 Error. Port 443 appears to be open. 1.) My website is working. 4-8.) Not sure this is my problem. Can someone point me in the direction if they think it is? I can troubleshoot those particular issues if I know they could be culprits. 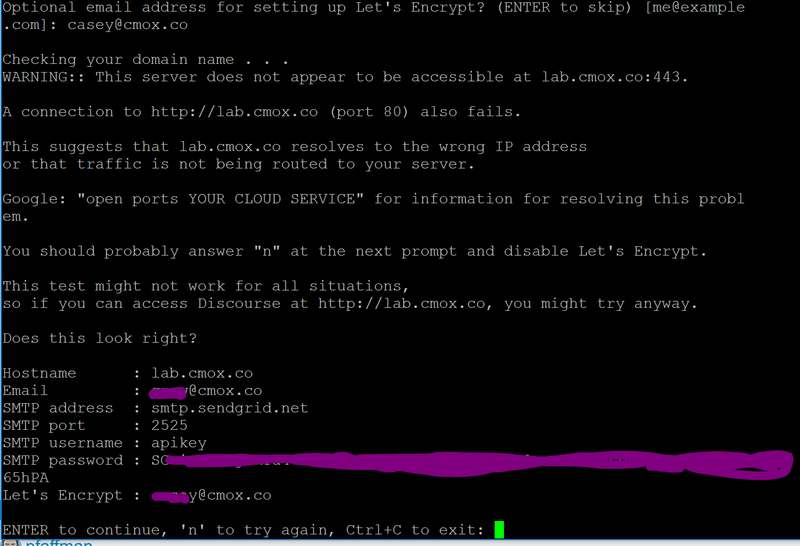 Can you help me identify if the problem is a Discourse, Cloudflare, LetsEncrypt or host (Digital Ocean) problem? The first think you want to do is disable CloudFlare completely as it causes many problems here. No. It should not. It is a different server with different everything. You should make cloudflare dns only and run discourse-setup again to enable let’s encrypt. Note that I am bypassing Cloudflare CDN and only using it for DNS. Can y’all help me resolve this error? Thank you for your help so far! I feel like I’m nearly there! We don’t support the 1 click install here. Only installs which follow the standard install guide. If you’re going to continue using it then you need to contact DigitalOcean for assistance. Access by IP is also completely unsupported. Make sure DNS is pointed at the new droplet. I got it all set. Thanks for your patience and support. I have intermediate.crt how can i concatenate the cert files? From all I remember doing this years ago, it simply copying and pasting a bunch of chunks into a single file. I do however recommend just forgetting about this mess and going with lets encrypt.